It’s reported that at least half of Icelanders believe in “hidden folk,” nature entities like elves but bigger—about our size, and invisible. After exploring the island for two weeks, I practically did too. From the moment I stepped off the runway in Keflavík (on a strip of volcanic rubble that looks like another planet) into the terminal with walls decorated with lines of poetry, I was entranced by the landscape and its culture, begun by Viking adventurers over a thousand years ago. 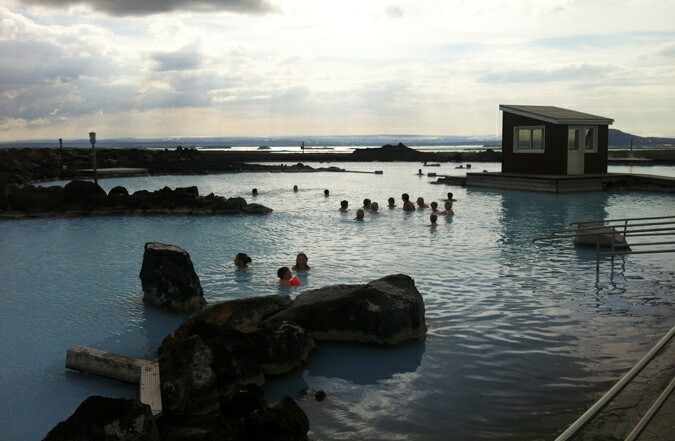 One cranky guidebook writer admonished the Icelanders for “not putting up guardrails” around gushing hot springs, cliffs, and other natural features. But it is exactly this unadulterated experience—raw earth, fire, water, wind, endlessly transforming the land where two continental plates (the North American and the European) are literally pulling apart—that gives Iceland its magic. For those two weeks, my husband, kids, and I explored the wide expanses of rock-strewn grass, glaciated volcanic peaks, deep fjords, rivers undammed and running at apocalyptic volumes, around the perimeter of the nearly 40,000-square-mile island. (Iceland’s deepest interior is practically impassable most months of the year, a barren plateau of volcanic fields, icecaps, and mountains.) We rode Icelandic horses, hiked ancient glaciers layered with recent volcanic ash, and dipped in hot springs daily. It wasn’t hard to imagine why “hidden folk” might still inhabit such a place. These are just a few of the highlights of that journey. 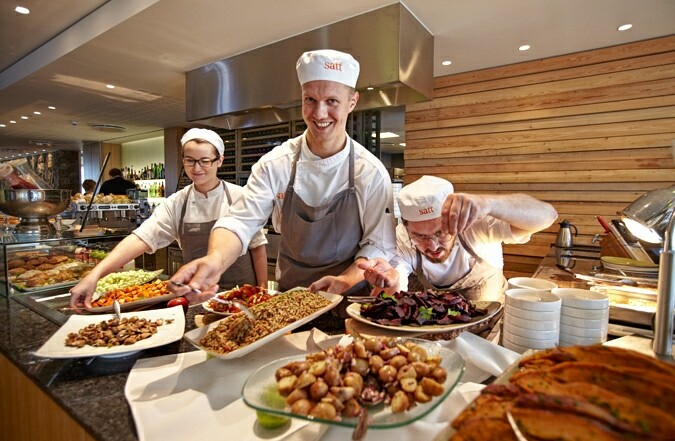 Our journey began at Icelandair Hotel Natura in Reykjavík, where chefs at Satt Restaurant (in Icelandic, satt means “true”) prepare fresh ingredients from local farms and geothermal-powered greenhouses. Like their Viking ancestors, today’s Icelanders eat a lot of seafood, pasture meats, whole-grain bread, and skyr—a thick, low-fat yogurt similar to Greek yogurt—but contemporary cuisine incorporates many more nuts, seeds, and fresh vegetables. Walking Reykjavík’s harbor in the everlasting evening—still light at 10:00 p.m.!—brilliant low-angled light illuminates the Harpa Reykjavík Concert Hall. 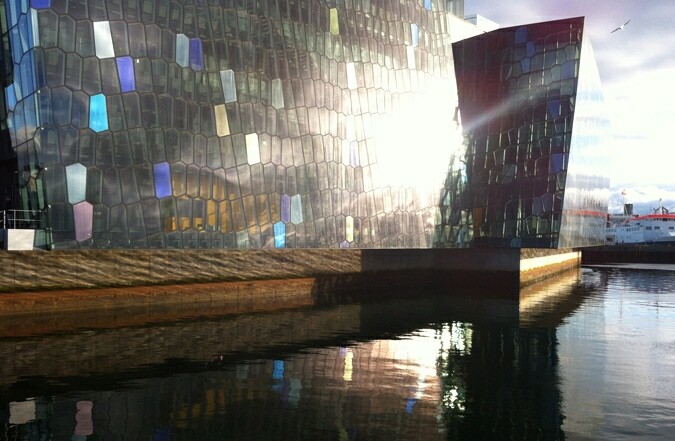 In a country famous for producing musical acts like Björk and Of Monsters and Men, the Harpa hosts some of the biggest names during international crowd–drawing music festivals (such as Icelandic Airwaves) as well as conferences, such as the World Congress of Esperanto or the Spirit of Humanity Forum. 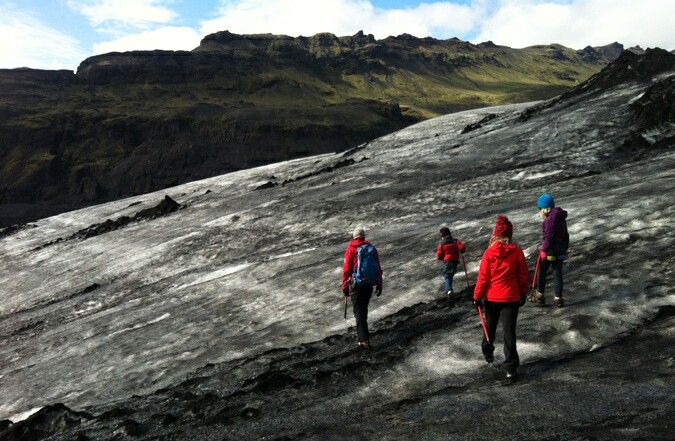 Just a couple hours’ drive from Reykjavík, with Icelandic Mountain Guides, we hiked the Sólheimajökull (or “Sun Home Glacier”) along the southern part of the island. The black ash coating the ice is from the 2010 Eyjafjallajökull eruption, which closed down European airports for nearly a week. At a nearby museum we watched a video documenting the astounding lava and melt-water diversion tactics that saved nearby towns. Ever wondered where the term geyser comes from? 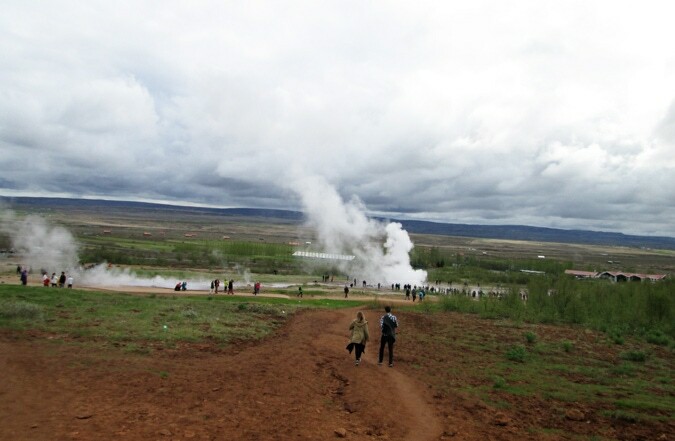 The phenomenon was named by Icelanders—from geysa meaning “to gush.” Although touristy, it’s worth a trip to the Haukadalur valley in Iceland’s so-called “Golden Circle” to see geysers up close. 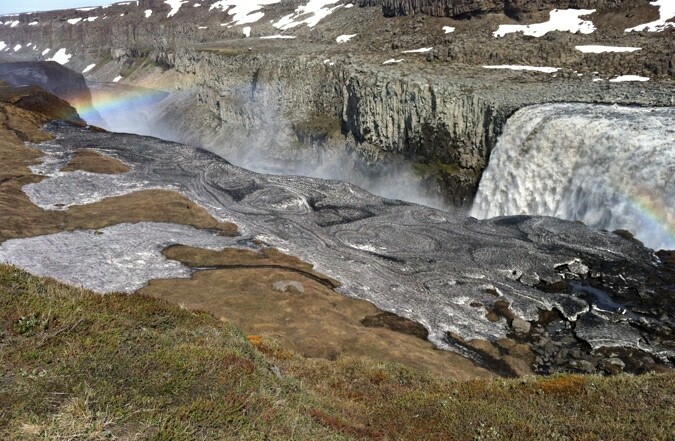 Check out the magnificent Gullfoss (“Golden Falls”) while you’re in the area, too. 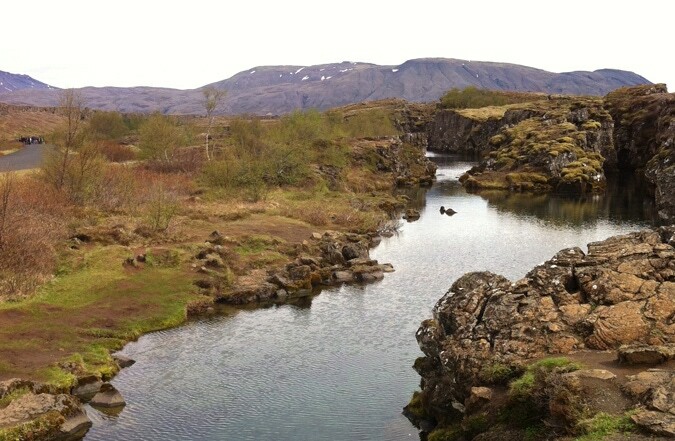 We stopped to toss a coin in the deep, crystal-blue waters of the Flosagjá, waters covering the rift between the two continental plates—Europe and North America—in Thingvellir National Park. Recognized as a World Heritage Site in 2004, Thingvellir means “Parliament Plains,” and is the historic site of Iceland’s official general assembly from 938 to 1798. 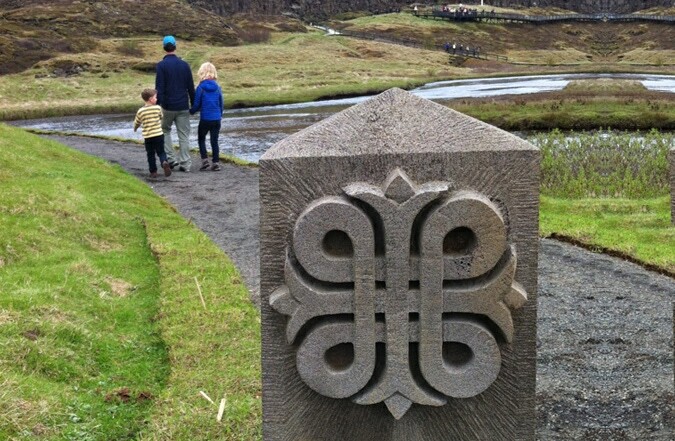 We saw this four-loop insignia—denoting a place of cultural, often literary, significance—all over Iceland. 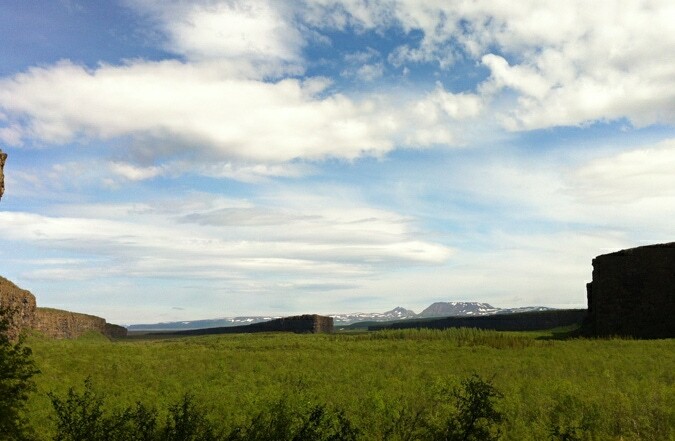 This one marks the cliffs of Thingvellir assembly’s Lögberg (“Law Rock”). In other locations, the sign marked sites from the Icelandic Sagas, Iceland’s prose histories dating back to the tenth and eleventh centuries. Many Icelanders trace heritage back to the legendary figures, events, and places depicted in the Sagas—hard to imagine as a wandering westerner with divergent histories and living family scattered from Maine to California. 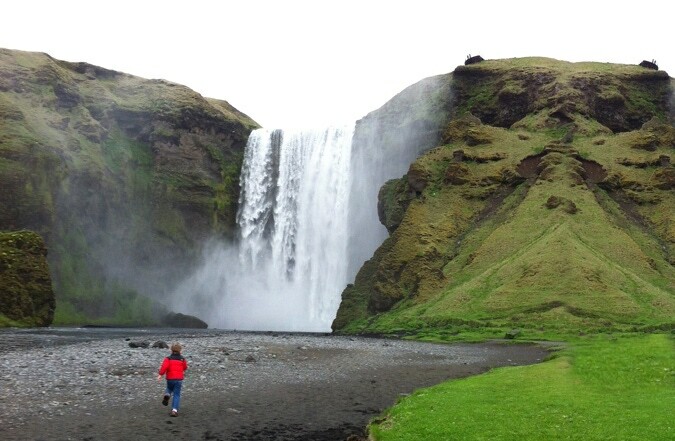 Before leaving for Iceland, my son checked out every kids’ book on Iceland he could find. 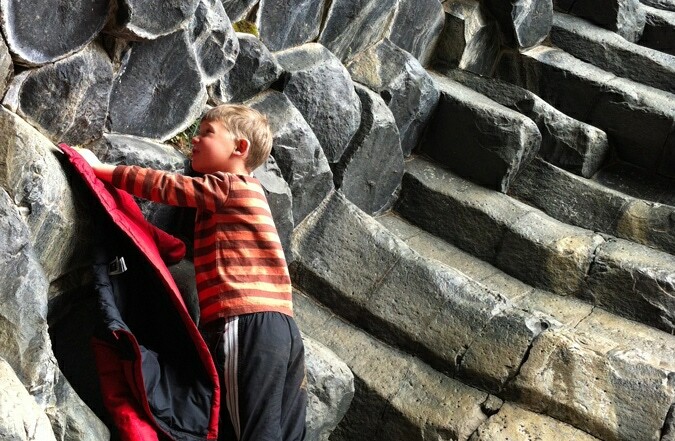 The books were filled with photos of natural features like the “troll rock.” He was determined that we see it. We parents weren’t so sure we’d find that one big lump of lava in a country filled with rocks. On our drive north, completely at random, we pulled over for a breath of fresh air, walked down the path and suddenly found ourselves face to face with the 60-foot-high troll rock, Hvítserkur. Before our journey, we consulted a friend from Reykjavík: Where should we definitely go in our two weeks? “Follow the sun,” he told us. 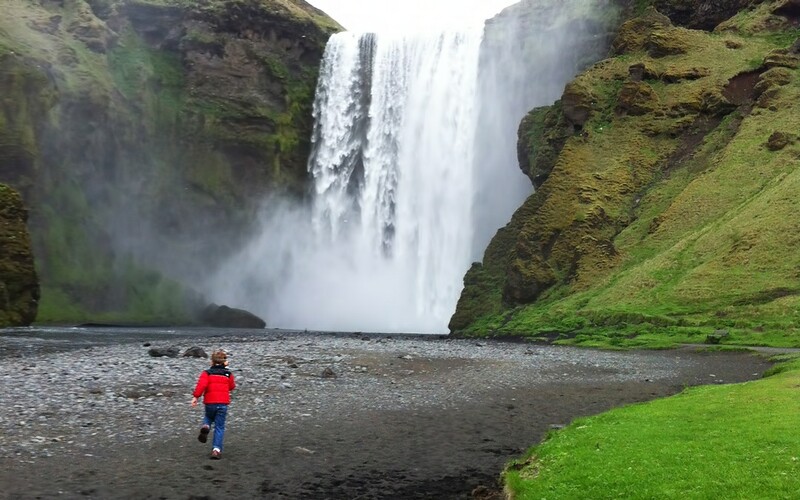 Iceland gets pelted by strong weather, even during summer months, but cool temps and rain rarely extend across the entire island. After a few days exploring the rainy southwest, we headed up and east along the north of the island, camping first at this lovely spot along Mývatn, a shallow lake in Mývatn-Laxá Nature Conservation Area. Hot springs au naturel aren’t exactly my thing, so it was blissful to find incredible spa facilities like the Mývatn Nature Baths even in the far-flung regions. (After you leave Reykjavík, most towns are small, and many that we imagined larger on maps were nothing more than a cowshed and a café.) We enjoyed a long soak and bought “steam bread”—a moist, sweet, chewy bread baked in natural geothermal steam vents—on our way out. Every second at Dettifoss—the most powerful waterfall in Europe, located in Vatnajökull National Park—over 1,600 cubic feet of glacier melt-water plummets 148 feet in a roaring white expanse, kicking up misty rainbows and rushing out through the Jökulsárgljúfur canyon. The water (part of the river Jökulsá á Fjöllum) eventually reaches the Greenland Sea along northern Iceland. A devil’s staircase? Further downstream on the Jökulsá á Fjöllum river, we spent an afternoon hiking around the remote Hljódaklettar (“Whispering Cliffs”), the stunning remnants of volcanic plugs that cooled into honeycomb-like basalt cliffs. As it hits the angular rocks, the river’s sound seems to surround hikers, as if the rocks themselves are shushing and murmuring. As a southwest US desert rat, I’ve spent a lot of time with rocks, and I’ve never seen (or heard) anything close to these otherworldly black cliffs. 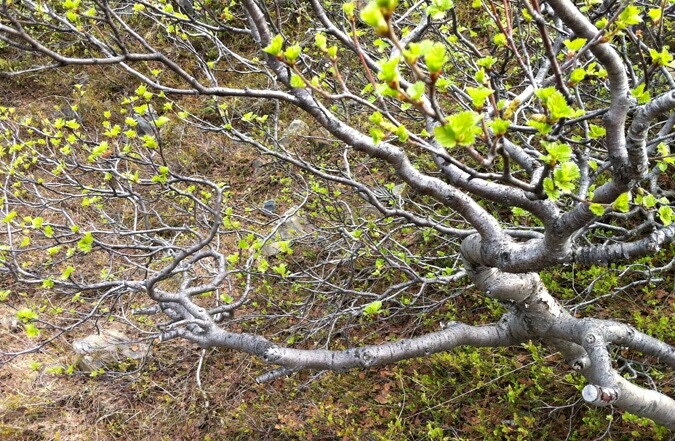 As far north as it is, Iceland’s June is more spring than summer—luminous yellow-green leaves dot the rocky landscapes in deciduous trees or willow bushes. Anything the light touches is luminescent, made only more surreal by the long summer hours. 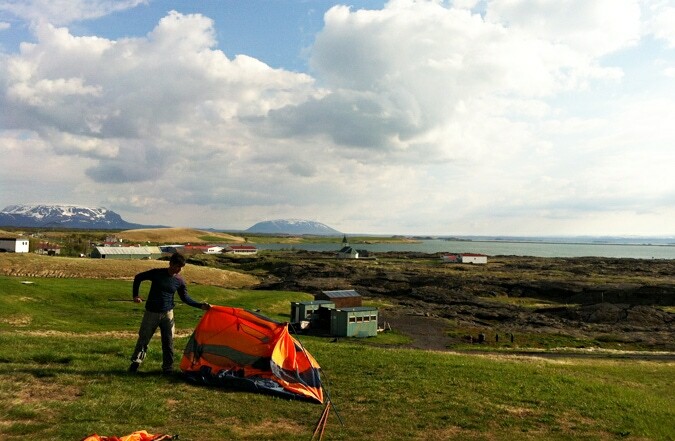 At the furthest part of our journey, we camped in Ásbyrgi, a horseshoe-shaped canyon at the northern edge of Vatnajökull National Park. 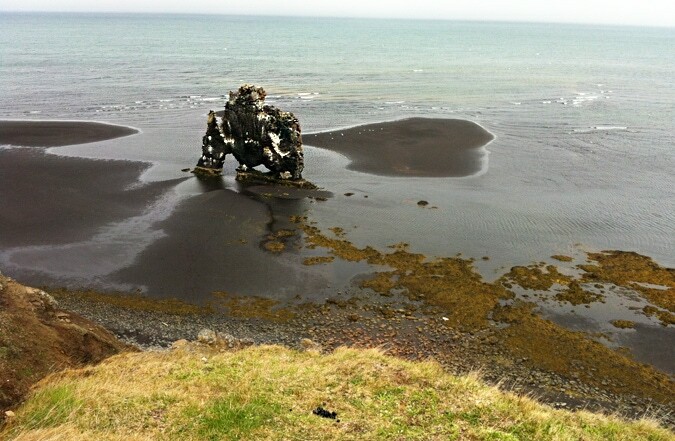 Legend says that it was formed by the hoof of Sleipnir, the Norse god Odin’s eight-legged horse. 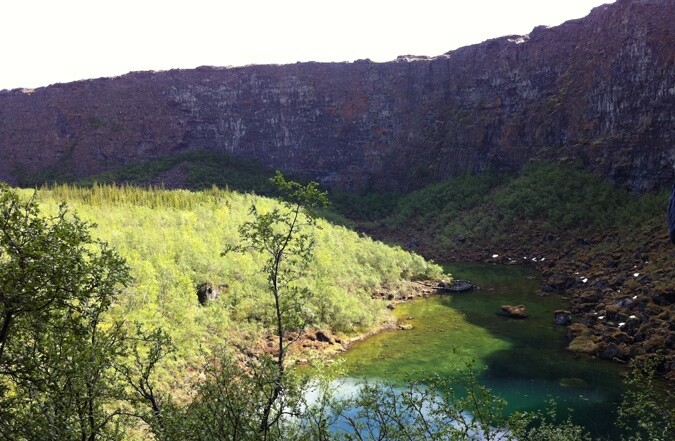 Filled with rare woodland, Ásbyrgi canyon contains a small lake at its southern end. Ásbyrgi is said to be the “capital city” of the hidden folk. Enchanted, yes. We left Iceland a few days later, but Iceland’s visceral magnificence has not let me go.